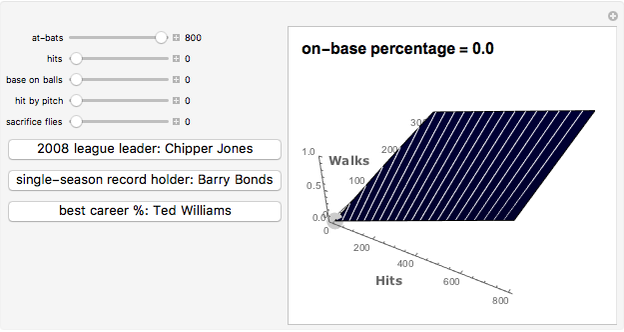 This Demonstration is a graphical representation of the On-Base Percentage (OBP) statistic, which is widely used in baseball. OBP is based on (1) the at-bats a player has had; (2) the number of successful hits in these at-bats; (3) the player's walks; (4) the number of times the player has been hit by a pitch; and (5) the number of sacrifice flies the player has hit. In baseball, the walks, hit by pitches, and sacrifice flies are not counted as official at-bats, and so these stats must be separately accounted for in the OBP formula. Because sacrifice flies and hit by pitches are so rare (and therefore have a small influence on the graph), the axes of the graph use hits and walks, which are much more abundant. 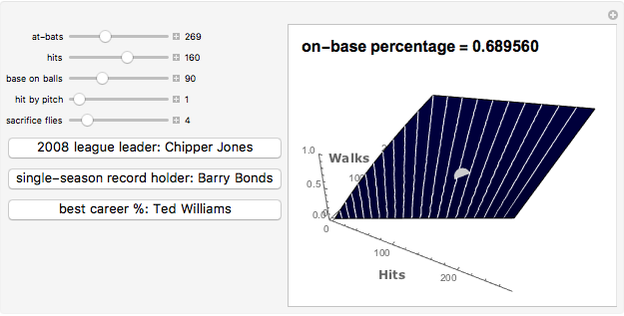 This Demonstration calculates and gives a visual representation of any OBP. Using examples, it can help in obtaining a better understanding of one of the most popular statistics in the game of baseball. Danny Strockis "Baseball: Graph of On-Base Percentage"